If you want a really well-made and long lasting residential wine storage unit then the Le Cache Contemporary wine cellars are highly recommended. 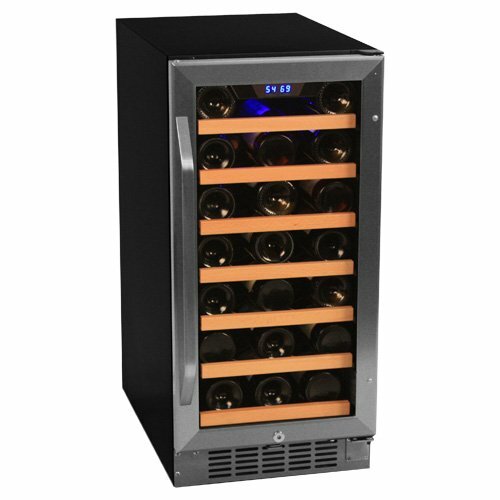 Why Le Cache wine cabintets stand out from other luxury residential wine coolers and wine cellars? Le Cache’s attention to every detail is reflected in every small part of these premium wine cabinets. Le Cache wine cellars are extremely well-made from solid wood – including the Interlock racking system – instead of laminates or fiberboard. The hardwood cherry veneer is available in 3 finish options. The fine hand-stained finish enhances the natural grain structure of wood. These wine cabinets are not merely functional items for wine storage but an elegant piece of furniture that will be fine decorations in your home and arouse envy of your friends and guests. Highly effective thermal insulation to maintain constant temperature inside the units. Racking Accommodates Almost All Bottle Sizes and Types. Most wine refrigerators or refigerated wine cellars don’t accept large or odd size bottles so you can’t store and cool champanges. This won’t happen if you have a Le Cache wine cabinet. Rackings made by other companies have 3 1/4″ wide openings while Le Cache’s sealed cherry wood racking system’s 3 3/4″ width ensures a spacious compartment for bulk storage of Magnums or other hard-to-fit bottles. Le Cache Cabinets have 5 year warranty on the cooling unit and 2 year warranty on the cabinet. What’s more Le Cache has very reliable and prompt customer service should you have problem or questions regarding your wine cabinet. The Model 1400 in the Le Cache Contemporary series wine cellars has 172 bottle capacity which is the smallest within this range. The universal all-wood racking system can accommodate max. 172 bottles (160 racked, 12 bulk storage). These are single temperature zone wine cellars with a range of 55°F – 58°F. The well-built racking system is constructed by hot-glue assembly technique with eased edges, tapered end, and precise fitting. It consists of 6 rows and 14 rows with 3 3/4 inch wide openings that accept most bottle sizes and shapes including champagne and Burgundy bottles. The hardwood door has UV filtering, tinted, thermal glass providing a fine view of your wine collection inside the cabinet illuminated by the low-intensity fluorescent interior light. The slim stainless steel bar door handle and eleganwindow arch enhance the classic look of the wine cellar. The door comes with lock& key so that you can prevent unwanted access to your precious wines. The high level of thermal insulation of these exquisite furnitures is ensured by the double pane door glass, the 1 1/2″ inch thick foil-backed polyurethane insulation and the airtight seams throughout the whole cabinet. The US-made highly advanced CellarPro cooling system is installed in all Le Cache wine cellars ensuring optimal storage conditions for wine and allowing you high level of flexibility to adjust and control the environment inside the cabinet. Besides setting the temperature you can adjust humidity level inside the cellar, too. The blue LED readout diplays all information in clear, readable from. The cabinets can be upgraded with CellarPro 1800XT cooling system for extreme weather conditions (high temperature and humidity) though you have to compromise with the slightly higher noise level. The auto defrost feature pevents ice accumulation inside the cabinet. To prevent unnecessary running of the cooling system CellarPro can be set to operate in energy-saver mode. But if you need to cool the interior of the cabinet quickly there’s a quick-chill mode as well. Audible and visual alarm warn you if the conditions inside the cellar differ from the set values. There’s also a maintenance indicator that tells you when it’s time to clean the condenser coils. The Le Cache Contemporary Wine Cellar Model 1400 sells for around US$ 3000 – 3800 (US$ 17.44 – 21.35 per bottle). Weight: 320 lbs. (empty cabinet), Full cabinet: cc. 836 lbs. Due to the massive size and the weight of the cabinet it has to be placed on hard, level surface. If you place the wine cellar in a room where the floor is covered with thick carpet do place a cc.3/4″ thick plywood board underneath the cellar. The installation of all Le Cache cabinets require Zero Clearance at the back. A 18″ clearance is necessary at the top for proper ventillation. When opened at 90° the hinged side of the door requires 1″ space from wall. Make sure you properly level the unit with the leveling legs. Note that the weight of the door of the empty cabinet might tilt the cabinet forward when placed on the floor. Load some bottles at the back of the cellar to counterweigh the tilting effect of the door. Use the leveling legs if necessary to properly level the wine cabinet. 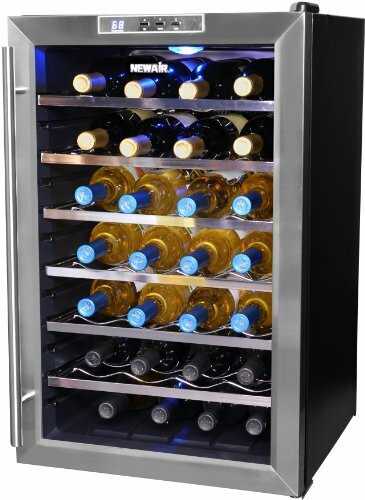 The Le Cache Contemporary Wine Cellars Model 3800 can hold up to 458 bottles of wine. The most spacious item in the Contemporary Series is the Model 5200 with 622-bottle capacity. TIP: see also Credenza Wine Cabinets by Le Cache and other manufacturers. TIP 1: Vinotheque wine cabinets offer similar stoarge space, powerful and accurate cooling system and versatile styles and designs. 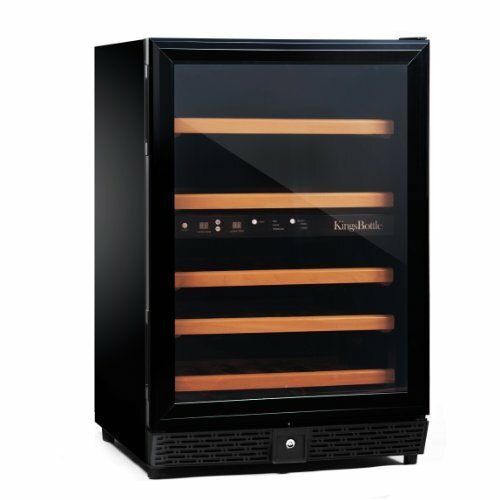 TIP 2: for a similar storage capacity take a look at the Vintage Keeper Nuvo VP 500 Wine Cellar that can accommodate max. 500 bottles of wine. TIP 3: for other large capacity, quality wine storage units read our page about Best Large Wine Coolers and about Walk-In Wine Vaults. 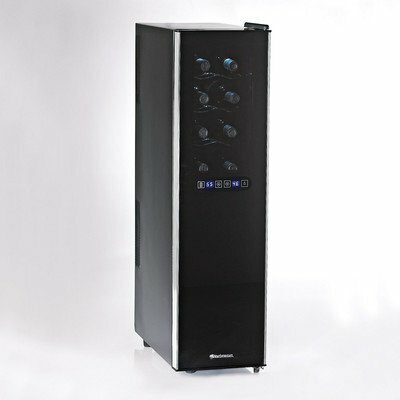 The Electrolux ICON™ Designer 160 Bottle Wine Cellar is a good alternative in the 100 bottles capacity range. The Liebherr WS 14300 Triple Zone Wine Cellar can accommodate up to 143 bottles of wine. The GE Monogram Wine Vault is for those who have or plan to have around a 1000-bottle collection of wines. If you consider building your own home wine cellar you’ll need a quality wine cellar cooling system. 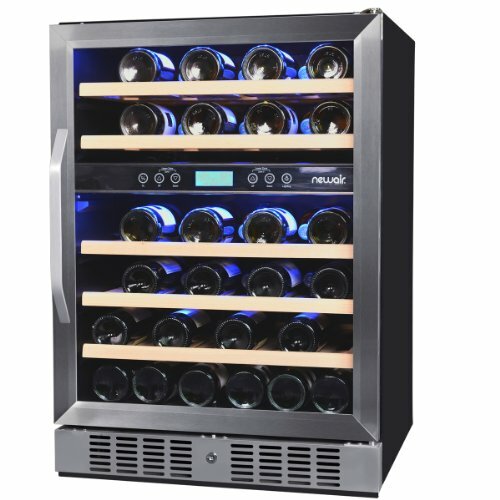 People who purchased Le Cache wine cabinets are all very satisfied with the product to the extent that some of them are considering buying more units. Many have commented on the seamless and effective customer service. A minor observation by one user was that bottles with very long neck (Don Melchor bottles) can be fitted in only in one row on the rack.